The Eco Femme Organic Day Pad is ethically traded, and is designed for daytime using throughout your period, it features a comfortable soft unbleached organic cotton flannel top side, with 5 layers of absorbency, plus a hidden PUL (polyurethane laminate) layer for leakproofing. 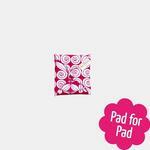 The pad is backed with a colourful pink print fabric. Use this pad plain side towards your skin. Each Organic Day Pad comes packaged with full instructions, and all packaging is recycled. Price is for a single pad. The Eco Femme Organic Day pad measures approximately 21.5cm long x 6cm. In testing we observed slight pad shrinkage after pre-washing them, the sizes quoted are after washing, so your new pads may appear slightly bigger.